Left to right: Blue crab (Callinectes sapidus), sargassum crab (Portunus sayi), and the blotched swimming crab (Portunus spinimanus), all shallow-water "swimming" crabs in the family Portunidae. Note the paddle-like swimming legs. Crabs are any of the species of crustaceans belonging to the taxonomic infraorder Brachyura (the true crabs). In total, there are 6,793 species of crabs spanning across 93 families. Crab species can be found in every ocean and most land habitats as well . They undergo a form of metamorphosis that contains a series of larval forms . True crabs are distinguished by their five pairs of walking legs and a pair of chelipeds. Crabs are decapods and all have bilateral symmetry . Crabs are also Crustaceans, relating them to crayfish, lobsters, and shrimp . Organisms bearing similar names such as hermit crabs, king crabs, porcelain crabs, horseshoe crabs, and crab lice are not true crabs . Crabs are invertebrates, meaning they do not have a backbone. Because of this lack of a spine, crabs gain their support from a tough exoskeleton composed of chitin . The exoskeleton protects the crab from predatory attacks and the environment. When a crab has molted its shell while the new shell is yet to be formed, it is known as a soft-shelled crab. While in this state they are completely defenseless  Most soft-shelled crabs are considered delicacies by humans and are eaten worldwide . 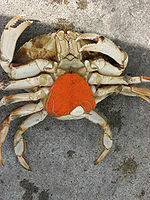 The crab has three body segments: the head, thorax, and abdomen. The head and thorax are often considered as one body segment called the cephalothorax , and they are joined with a carapace, the section of the shell that is the most strengthened . Crabs have five pairs of legs and one pair of claws, called chelae . The legs of a crab are segmented at three or more points and are used for the various activities of the crab, such as swimming, feeding, digging, defense, and signaling . The legs are so formed that a sideways walk is most efficient . This fashion of walking is known as “crabwise” . The claws of male crabs are usually larger than those of the females. . The eyes of the crab rest upon eyestalks extending from the head . Male crabs are marked by a triangle-shaped marking on their underside, which female crabs lack . Crabs also have the incredible ability to regenerate, a process that replaces limbs lost with new ones . 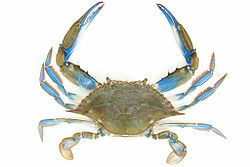 The Blue crab will be used to demonstrate the life cycle of crabs, as it is one of the most common extant crab species. After hatching from an egg, the Blue crab begins it's life as zoeae, the first larval stage. The zoea has a transparent body, and resembles the design of that of a shrimp. Zoeae feeds by filter-feeding, drawing plankton into it's mouth. Over a period of weeks, the zoea grows via molting. When the final molting stage has been reached, the crab enters the second stage of life, called the megalops. The megalops bears a much more similar resemblance to that of a fully grown crab. The carapace begins to broaden and the claws form as well. After molting more, the Blue Crab moves on to the “First Crab” stage. The crab now fully mirrors the appearance of an adult crab, albeit far smaller. The crab continues to feed and molt until finally the adult stage is reached after about a year of larval stages. The adult stage now has fully developed body systems and reproductive organs.. The adult mating process begins when an adult female crab attempts to attract a male by releasing pheromones in her urine . Males that show potential interest perform a sort of dance ritual and, if the female accepts him, the male will grab the female and wedge her between his legs; holding her there with his claws. The two may stay in this position for several days, even a week if necessary. When several packets of sperm have been transferred to the female via gonopods, they will be stored in the female's body. She will leave the male and migrate to higher land to lay her eggs. Once at a higher elevation, the female will release fertilized eggs onto hairs on the outside of her body, forming a cluster or sort of “sponge”. The eggs will later hatch and become zoeae, repeating the life cycle of the Blue crab . All crabs lay their eggs in water, even those that are not aquatic . Most crabs are omnivorous scavengers, meaning they eat whatever edible substance they happen upon, plant or animal. The diet of crabs include algae, worms, dead animals, detritus, and even other crabs. Several other plants and animals are included in the crab's diet. Crabs also have many natural predators, such as the octopus, hawks, some fish species, sea gulls, squid, otters, and other crabs . Crabs live in a wide variety of locations, spanning from marine habitats to land habitats, and inhabit both fresh and saltwater habitats . Mud Crabs, such as the Black-Fingered Mud Crab, prefer to live in mud flats and under rocks and are highly prized for their great taste . Few crab species actually migrate, but those that do so do it spectacularly. The most famous example of migrating crabs are the Christmas Island Red Crab . Some crabs can even take advantage of other creature for defense means, such as the Coral Crab. The Coral Crab will pick up sea anemones to threaten and ward off potential attackers with getting stung . Crabs are beneficial to their environment by acting as decomposers, meaning they help maintain the level of decomposing matter down by consuming it . They also serve as important food sources for several species of birds, fish, and mammals . Crabs play a major role on the fluctuation of the economy, both in positive and negative ways. As of 1995, swimming crabs caught in Hong Kong are valued at $1000 dollars USD . The most common crabs caught and sold are swimming crabs because of the smaller size of shore crabs . The Scylla serrata is highly prized in China, as it is eaten in almost every life stage and yields about 22,000 tons annually  . In 2008 alone, an approximate 1,560,734 metric tons of crab were caught and sold from wild and agriculture locations . About 20% of all marine crustaceans caught, farmed, and consumed worldwide are crabs, amounting to 1.5 million metric tons each year . Not all crabs are beneficial to the economy however. The European Green Crab (Carcinus maenas) is a menace to commercial and recreational shellfisheries . The European Green Crab also consumes large quantities of eelgrass, an essential environmental seaweed . Efforts to restore eelgrass beds range from $18.6 to $22.6 million each year . ↑ 1.0 1.1 1.2 1.3 1.4 1.5 1.6 1.7 1.8 . Crab. Wikipedia. Web. Accessed November 6, 2011. Author unknown. ↑ 2.0 2.1 2.2 . Zinski, Steven. Blue crab Life Cycle. Bluecrab. Web. Accessed 6, 2011. ↑ 3.0 3.1 3.2 . Rouse, Wesley. Crabs: Their Taxonomy, Anatomy, Physiology, and Geographic Distribution. Suite101. Web. Accessed 20, 2011. ↑ 4.0 4.1 4.2 4.3 4.4 . Downey, Douglas. New Standard Encyclopedia. Chicago: Standard Educational Corporation, 1996. page C-617. Print. ↑ 5.0 5.1 5.2 5.3 Porch, and Batdorf. Biology with Laboratory Exercises. South Carolina: Bob Jones University Press, 2005. 477. Print. ↑ 6.0 6.1 . Johnson, Sylvia. Crabs. Thinkquest. Web. Accessed 20, 2011. ↑ . Zinski, Steven. Blue Crab Mating. Bluecrab. Web. Accessed November 6, 2011. ↑ . Zinski, Steven. Blue Crab Spawning. Bluecrab. Web. Accessed November 6, 2011. ↑ . Brown, Nate.Is a Crab a Carnivore or an Omnivore?. Ehow. Web. Accessed November 6, 2011. ↑ . What Animals Eat Crabs?. Askkids. Web. Accessed November 22, 2011. Author Unknown. ↑ . Black-fingered Mud Crab. Chesapeake Bay. Web. Accessed November 6, 2011. Author Unknown. ↑ . Christmas Island red crab. Wikipedia.Web. Last modified on November 20, 2011. Author Unknown. ↑ 13.0 13.1 . Marine Species: Crabs. Crd. Web. Accessed November 6, 2011. Author Unknown. ↑ 14.0 14.1 14.2 . Chan, Noel. Economic Importance. Cityu. Web. Accessed November 19, 2011. ↑ . Crab Fisheries. Wikipedia. Web. Accessed November 22, 2011. Author Unknown. ↑ 16.0 16.1 16.2 . Lovell, Sabrina. Ecological and Economic Impacts and Invasion Management Strategies for the European Green Crab. Epa. Web. Accessed November 6, 2011. This page was last modified on 24 July 2014, at 16:07.